Rusty Hustler, the conservation coordinator for the branch approached officials from Northwest Parks to obtain a better understanding of the situation and the management challenges faced at the reserve. It was explained that due to the drought that prevailed for four months and the lack of water in certain parts of the reserve, many new born animals had died. November to January is calving season for many species. Another major problem was the buffalo that were breaking out of the reserve in search of better grazing and water. The management team of Kameeldoring Branch with the help from other members decided to provide additional water for the game on the reserve. The team focused on an area where the only available waterhole was decommissioned due to it being close to the wetland area. 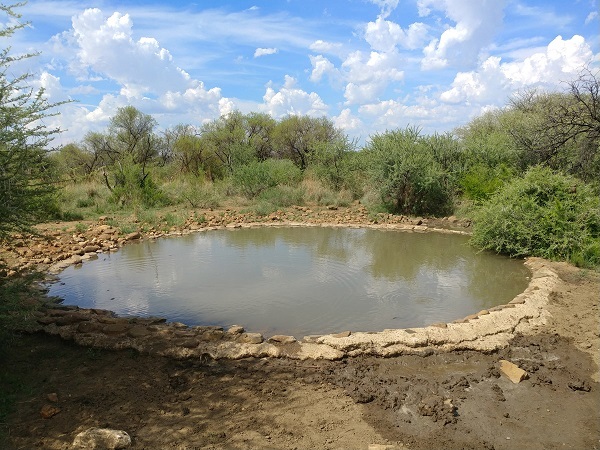 Due to poor rainfall the past few years, the area however dried out and it was necessary to resuscitate the waterhole again. Using their own funds, they immediately got to work and equipped the borehole with solar panels and a pump. Within two days the project was completed, and water started flowing into the man-made waterhole. The spill-over provides water to the adjacent natural depression that is more suitable for species like rhino and buffalo. 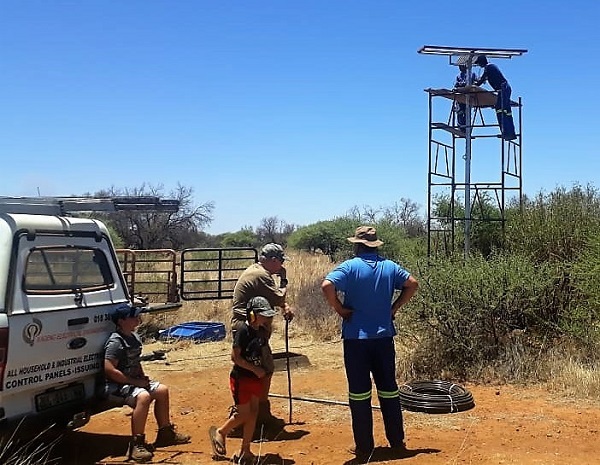 According to Pieter Nel, Conservation Manager of Northwest Parks, the repairs to the water supply attracted buffalo and other game to that underutilised section of the reserve with visible improvement in the condition of game as a result. Lizanne Nel, the Conservation Manager of SA Hunters says: “The future of protected areas will increasingly depend on the collaboration between conservation authorities and non-governmental conservation organisations such as the SA Hunters and Game Conservation Association as government funding and resource allocations for protected areas will remain a challenge.” Well done to the branch management for making these decisions that have also stimulated a growing interest in the conservation projects undertaken by the Branch.